In large bowl, whisk together flour, sugar, baking powder, cinnamon, baking soda, salt, ginger, cloves and nutmeg, flax, oatmeal, pumpkin seeds; mix in walnuts and cranberries. In separate bowl, whisk together eggs, pumpkin puree oil and vanilla; pour over dry ingredients. Stir just until dry ingredients are moistened. If mixture turns out a little dry just add 1-2 Tbsp. milk. 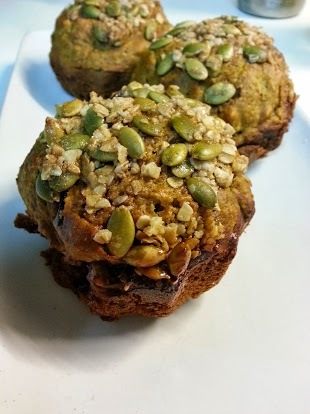 For the topping, melt the butter and mix with pumpkin seeds, oatmeal and Splenda/brown sugar. Spoon into prepared muffin cups. Spread with topping. Bake in centre of 375°F oven until golden and tops are firm to the touch, 20 to 25 minutes. Let cool in pan on rack for 5 minutes. Transfer to rack; let cool. Maple Cream Cheese Spread: In bowl, beat cream cheese until light; beat in icing sugar, maple syrup and vanilla until blended. (Make-ahead: Cover and refrigerate for up to 2 days.) Serve muffins with spread. From Jilly’s house to yours – Enjoy!